Combating uncertainty with algorithm designs and computer simulations, Professor Rick Middleton's electrical engineering research is helping to improve the efficiency of a number of real-world processes. Studying practical problems from a mathematical viewpoint isn't for everyone. For Middleton though, it's a satisfying challenge. His theoretical work involves 'a lot' of calculus, differential equations and linear algebra, and simultaneously (and surprisingly) adopts some of the creative thinking techniques usually reserved for those in the literary arts. 'My mind is quite analytical,' he admits. 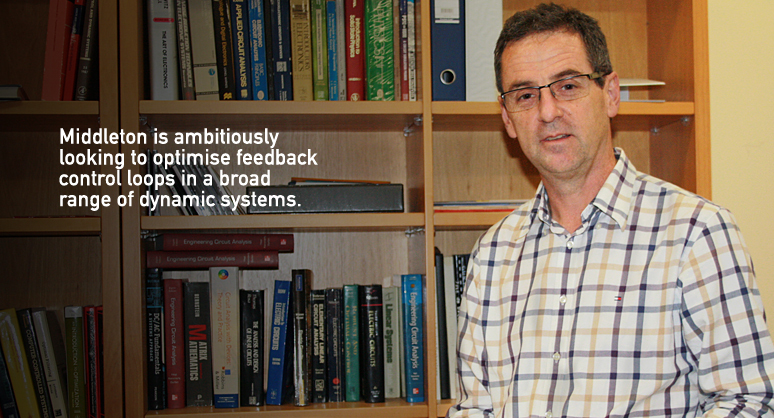 Adding to this unusual twist in investigative efforts, Middleton is ambitiously looking to optimise feedback control loops in a broad range of dynamic systems. The electrical engineer's multi-capacity algorithms are designed to regulate behaviours in industrial, biological and mechanical processes, with recognition of the need to combat – and sometimes just cope with – instability also influencing these adjustments. 'We're looking at things where the action you take now affects things over time,' he explains. Middleton first began exploring the creative constraints and opportunities of feedback mechanisms during his PhD candidateship in the late 80s. Opting to study computer control systems, the born and bred Novocastrian formulated differential equations to demonstrate the likenesses between analog integrated circuits and discrete time models. 'The two were once thought to be very different due to the way their mathematics had developed,' he says. At the same time valuing the differences between discrete time models and analog integrated circuits, Middleton was also able to reformulate computer controls so that they took advantage of operational incongruences. With measurements and adjustments made at finite points in the former, and measurements and adjustments made continuously in the latter, he similarly showed uncertainties could be accounted for by meeting somewhere in the middle. 'Instead of focusing purely on what happens next, which had long been the case for computer control systems, I used differences to indicate that we should really be looking at what happens between now and the next step,' Middleton discloses. Seeking to build on this understanding of system dynamics post-PhD, Middleton initiated a number of projects in health sciences and other fields. Working both here and abroad during these earlier research days, he also sought to expand the application of feedback control loops. 'Early efforts in feedback control involved electronic amplifiers,' the Institute of Electrical and Electronics Engineers Fellow explains. Another of Middleton's projects involved studying systems biology – this time in the Republic of Ireland. He took on a five-year appointment at the National University of Ireland Maynooth's Hamilton Institute, electing to approach the behaviour and dynamics of Parkinson's Disease from a novel mathematical angle. 'What happens in patients with Parkinson's is quite well studied in terms of the sequence of events, but it's not well understood in terms of what causes what,' Middleton concedes. Recognising the 'reasonably large impact' Parkinson's has on our aging society, the Director of the University of Newcastle's Centre for Complex Dynamic Systems and Control also sought to understand how the disease progresses despite common drugs used that compensate for the symptoms resulting from dopamine losses. 'We looked at particular cells in the brain, especially some of the neurons that degenerate early,' he says. Most recently, Middleton has been researching and revising renewable energy processes. He's collaborating with a PhD candidate, Sonja Stuedli, to examine the current behaviours of electricity suppliers and consumers. 'At the moment it's reasonably cheap to produce renewable energy but often hard for us to store – and this is well known,' Middleton asserts. Simultaneously conducting mathematical analyses and computer simulations of local load capacities, the pair is also looking to ensure homeowners are able to make the most of available energy resources. Sometimes things as simple as having signals from a central authority to let us know when there's too much power being used or there's some spare, these adjustments take full advantage of the rapidly varying generation of renewables. 'One of the other things people have realised is that if we were smarter in our homes about being able to turn things on and off and reduce our load at the right time, we could match up our consumption of energy to when cheap energy is readily accessible,' he declares. Acknowledging the study of single feedback loops is now 'largely done,' Middleton anticipates a shift in the direction of Control Theory research. Already talking about expanding smart grids and introducing smart cities, the multiple-award winner also points to a fundamental reengineering of electrical and telecommunications industries. 'Almost all of the problems we continue to have, even little things like finding a car parking spot at University, tend to worry about the dynamics and the effect of the answer,' he says.